If you're a card maker and love sketches, then let me direct you to the Retro Sketches blog. I love these simple sketches and enjoy checking out all the beautiful cards artists post there. What a great source of inspiration! 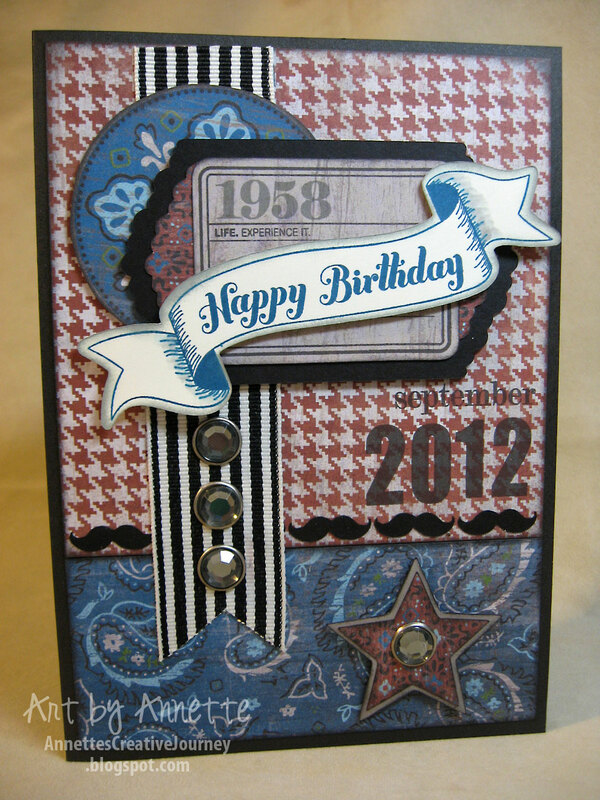 Although I often go there for ideas, this is my first time posting to the Retro Sketches blog with one of my card designs. 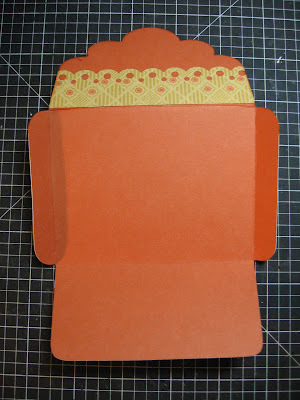 I was at a weekend crop not long ago and purchased some of this BE-autiful Bo Bunny Serenade paper. I just fell in love with all the deep rich colors and prints in this collection. 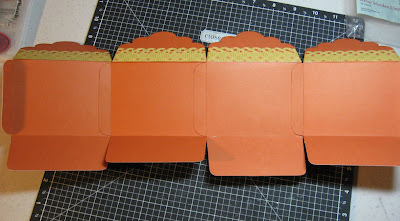 I like to buy the 6 x 6 stacks for card making and the 12 x 12's for scrapbooking. The gals I was cropping with loved this paper too, so I thought it perfect to teach them how to make this card in our monthly card-making group. I hope they like it. 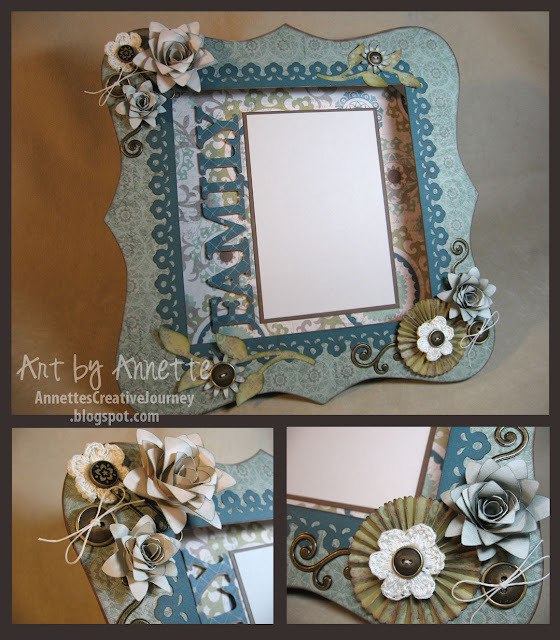 The flowers are cut from my Tattered Flower Garland (Sizzix Alterations strip die) by Tim Holtz (of course!) 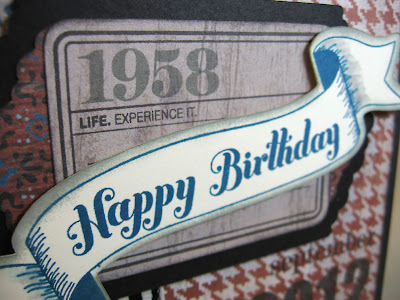 and I stamped each with a script stamp from Close To My Heart's Universal Backgrounds set. 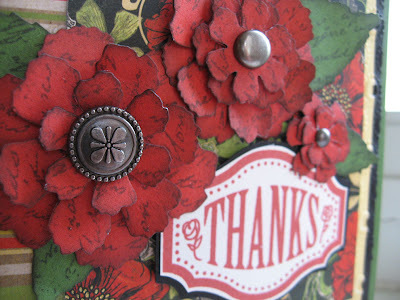 All the great pewter accents are Close To My Heart, as is the "Thanks" stamp which is from the Casual Expressions set. 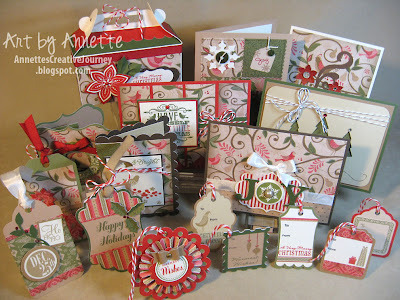 I love that so many of the expressions in this stamp set have a coordinating Cricut cut on the Artiste Cricut cartridge! Here's another pewter accent and a close-up look at the embossed background and border punch. Thanks for stopping by and checking out my card. 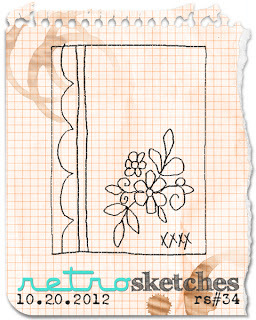 Why not hop over to the Retro Sketches blog and see what others have created using this week's sketch? 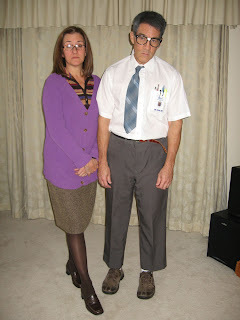 Anybody remember that commercial? Give me a shout-out if you do. 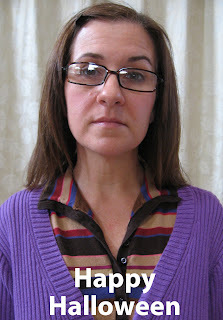 My title is my attempt to a clever little lead-in to today's post. While I love my new Artiste Cricut cartridge beyond words, especially for the all the cute boxes and packaging options, I have to say sometimes I am a bit disappointed that I can't make BIGGER boxes than what the machine is limited to. 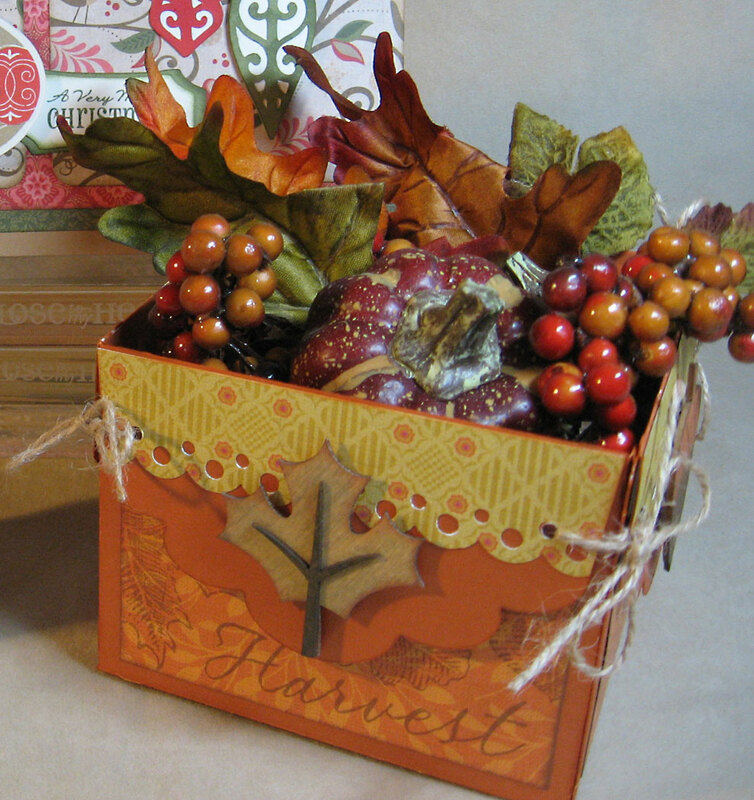 The box filled with Fall sprigs on the right is what I'm referring to specifically. 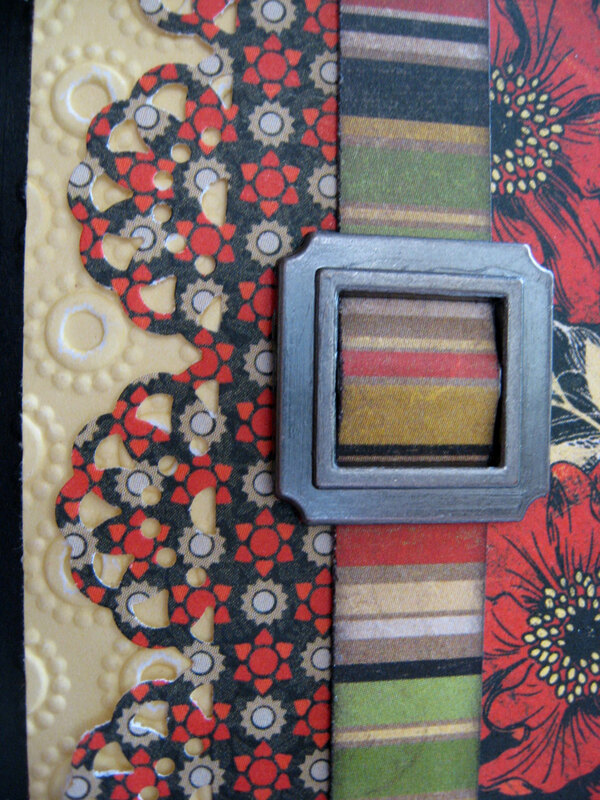 Artiste booklet, page 35, cut from Autumn Terracotta cardstock. Cut four at 3 inches each. The border is simply a 1 1/4 x 4 1/4 inch strip of B&T paper from the Flirty paper pack, then punched with one of my border punches and adhered to each envelope flap as shown. Fold on the scores then adhere each envelope to the next as shown. After you adhere them all together, finish off the bottom with adhesive and you're done. Now I have a pretty good sized box to fill as I like. 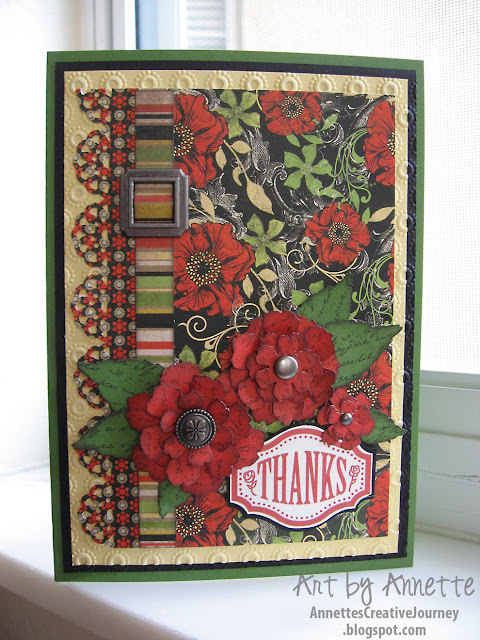 I adorned the flaps with Arbor Wooden Shapes which I colored with Close To My Heart's new pigment inks and tied the corners with jute twine. 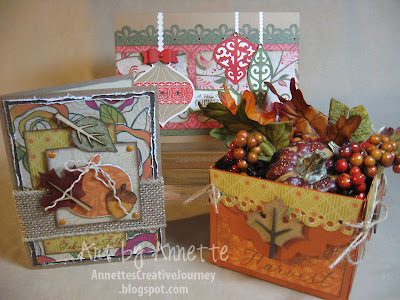 Stamping with done with Chocolate ink using the Fall Harvest stamp set. 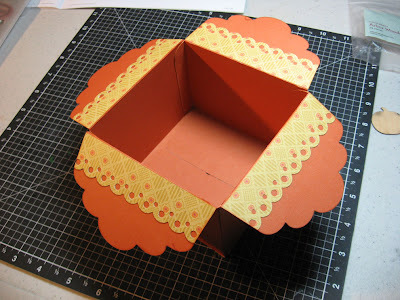 My finished box measures 3 1/4 high x 4 1/4 wide but you can certainly make an even bigger box simply by cutting out larger sized envelopes on the Cricut. I hope you'll give this a try. It's a fast, easy little table decoration. Each attending guest will receive a sweet little something at the door, plus EVERYONE will receive a wonderful mystery gift item whether they attend or order a kit. All materials are provided. You just need your supply tote with adhesives and tools to complete the projects. Kits will include photos and directions and pre-stamped, pre-cut materials, and will ship on Wednesday, November 14th. Sign up today. We are down to our last few! E-mail me your request at AnnetteGreen@me.com and I will send you a PayPal invoice. In the meantime, let me know if you have any questions at all. 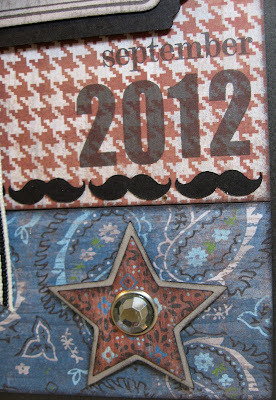 Finally I am up to date on my 12 Tags of 2012, inspired by Tim Holtz. September's tag is one for the men. 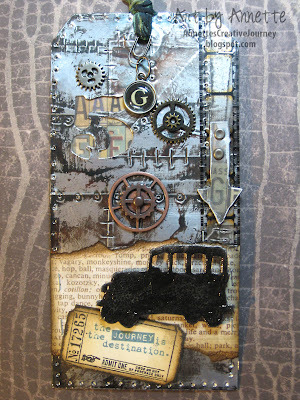 Check out Tim's industrial grunge-style tag here to learn how he achieved the look of riveted metal. I have to say although I love the pretty stuff, I really deep down love all this grungy inky vintage manly stuff too. This is a tough one to get a good photo of because the foil tape sheets are very reflective, but I hope you get the gist. There are a lot of details going on in this one, so be sure to click on the photo to get a closer look. For example, do you see the number 5 when you first look at the tag? See if you can find it. 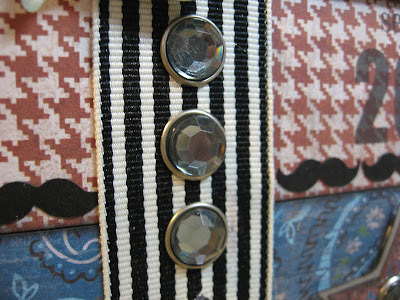 Tim used a metal numeral, of which I currently have none, so instead I used my newest Sizzix Alterations die "Cargo Stencil Number Set" and cut the five out of the tag, then layered some Lost & Found paper behind it. 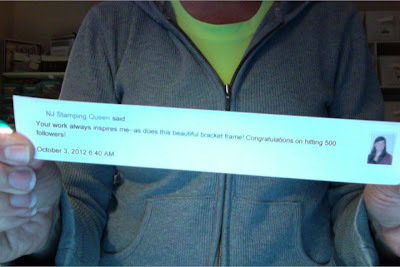 Oooh, this was a super messy tag to make and I loved it! Thanks for stopping by today. Good Saturday morning. Here in Melbourne, Florida we are experiencing the first hints of Fall and I am personally loving it. It's so hot for so long here that we truly appreciate the cooler temperatures when they finally arrive. My little family enjoyed a very pleasant morning on the porch, sipping coffee and reading the paper. By 9 a.m. though the sun has started to blaze and things are warming up rapidly. Time to come inside and blog about my August tag. So what's with the tags? Tim Holtz (I dreamed about him last night, literally) creates a fabulous tag each month to inspire and teach us new papercrafting techniques. 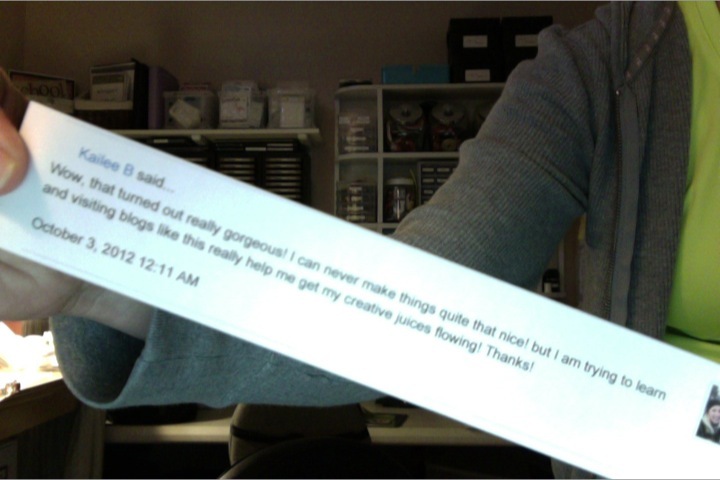 We bloggers, in turn, create our own monthly tags using what we learned. 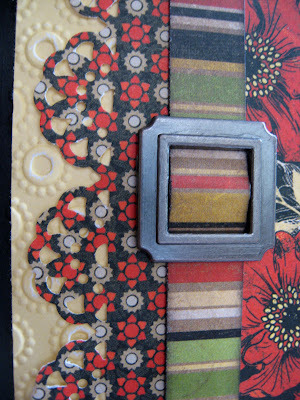 I've gotten myself a bit behind and am catching up on my August and September tags this weekend. I wish this photo did this tag justice, but it just doesn't. Trust me when I saw it's really pretty in person. Tim used a cameo stamp as the centerpiece for his tag, and since I didn't have that image I thought of August in Florida and the tropical summer and came up with this theme instead. 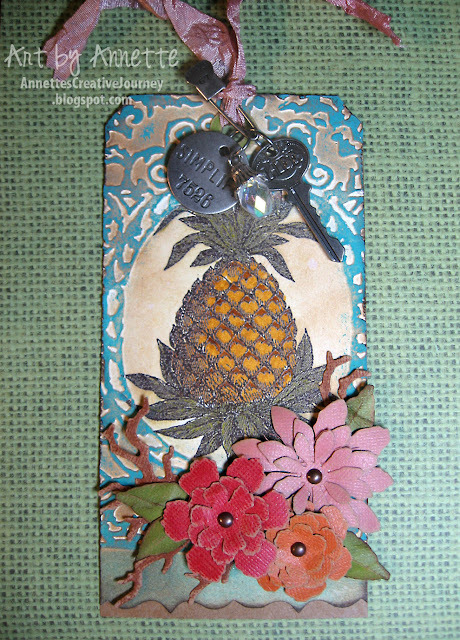 The pineapple stamp is from Impression Obsession, and I stamped it with Cocoa brown embossing powder then colored it in with Tim's Distress Markers. 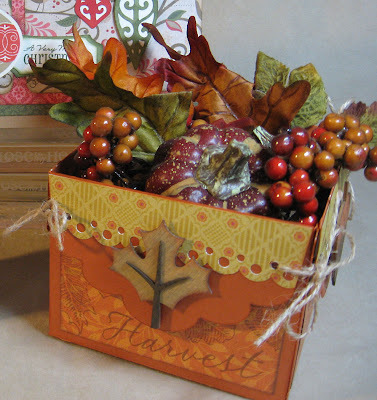 Tim used the pinecone die from Sizzix to make rolled flowers, which I love, but I have yet to get my hot little hands on that die, so instead I used the Tattered Flower Garland and Autumn Gatherings dies to create my layered flowers, twigs and leaves. These pieces were cut from Kraft Core card stock and lightly sanded. I love that stuff! I'll be teaching my All Things Tim Club how to make today's tag along with my October tag and September's which I will post tomorrow. Until then, have a lovely day! 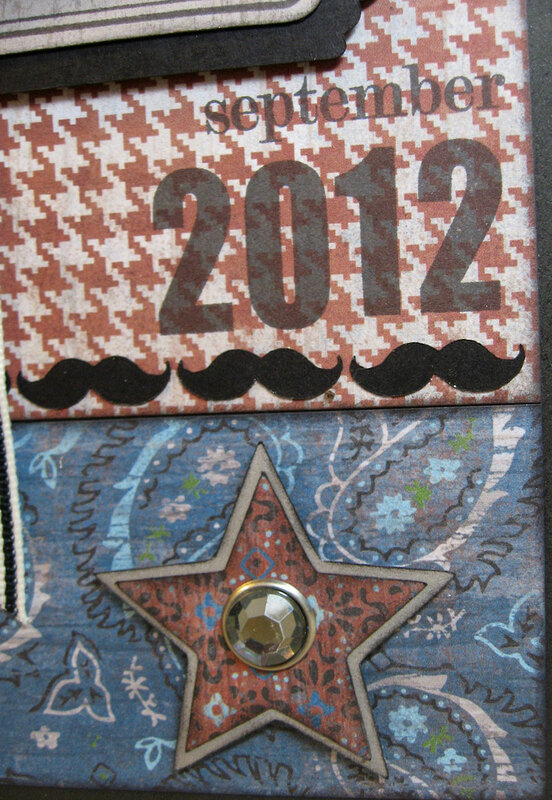 I've spent the past two days catching up on my August, September and October tags of Tim Holtz's 12 Tags of 2012. With so much else going on with my business, this was a nice break getting back to my grungy side. Today I'm sharing my October tag and I'll post my August and September tags over the weekend. What fun it was so get all inky, glittery and painty again. I washed my hands so many times today I stopped counting after a dozen, but OH the joy! Enough chit-chat, here's my take on the techniques in Tim's October tag. 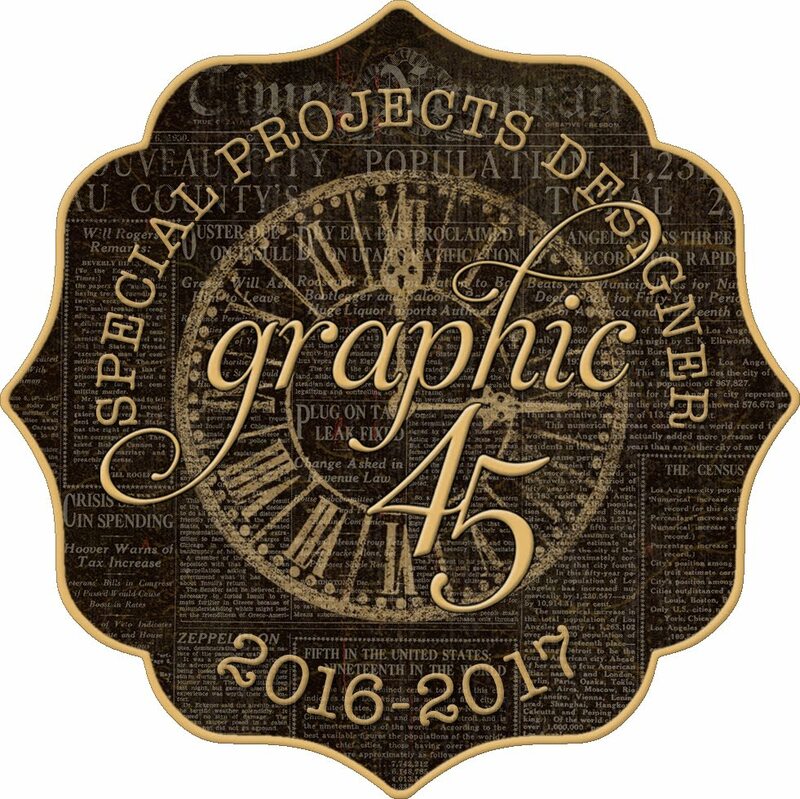 The moon comes from Graphic 45's Happy Haunting, and the rest is all Tim. Be sure to check out Tim's October tag and his technique to make this homemade chunky glitter. 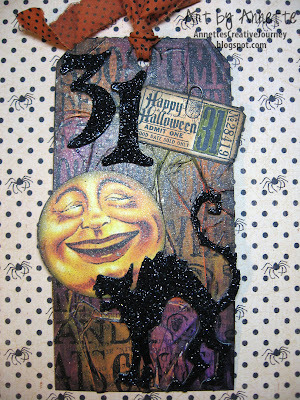 He gives you all the steps to make your own tag and lots of inspiration to get your spooky juices flowing. It's coming up on that time of year already where Christmas music will soon be playing in all the stores, reminding us that we'd better get on the ball soon. Each year, I try to help get ahead of the last-minute rush by offering my annual Holiday Workshop. 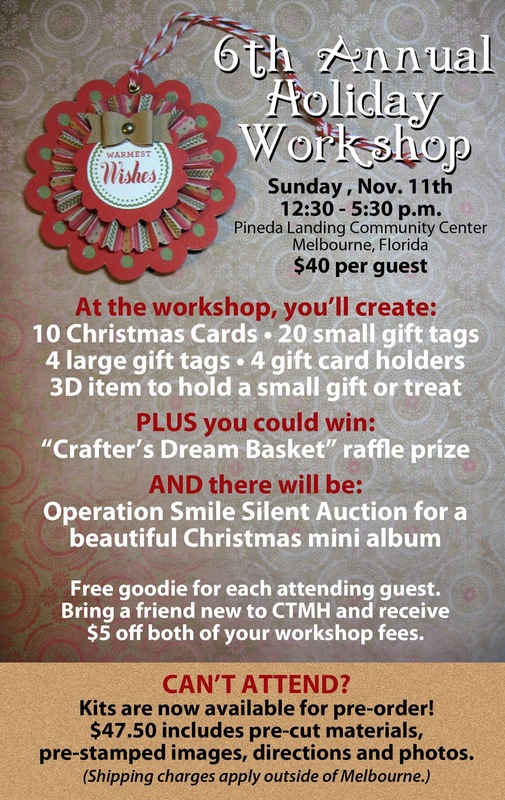 Imagine in one afternoon getting all your holiday gift tags made (HAND-made), a bunch of Christmas cards, a gift box, and some gift card holders. This is my sixth year of offering this fun and fabulous workshop and this year I'm happy to welcome fellow consultant DiAnn Denson as my partner. We've been working hard since August planning, designing, and preparing what hopes to be an even bigger and better event than ever. 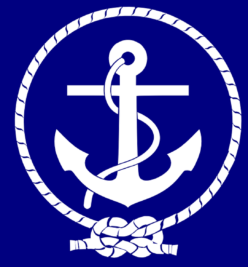 Don't dispair if you don't live here in Florida or if you simply cannot attend. You can take advantage of a prepared kit! Read on for more information and to order your kit below. If you CAN attend, excellent! Just leave me a comment below with a way to contact you and we'll save you a seat and get your payment information. 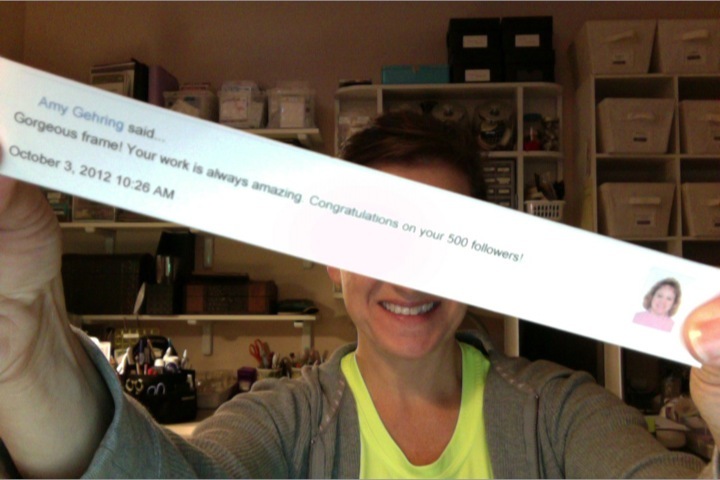 This is my most popular workshop of the year! Tomorrow I'll bore you all with some photos from our trip to New Hampshire. Meanwhile, have an excellent Monday!